Where To Buy Roses is an excellent question? But which blossom to buy maybe an even more important one. The Emilia Rose, a Sweet Pink Rose, is a classic addition to any wedding, birthday party, mother's day celebration, Valentine's Day dinner, or any occasion centerpiece or bouquet. It will add a touch of harmony, color, and loveliness to any floral arrangement. 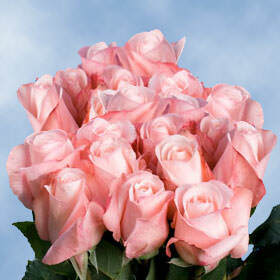 It is a, like all pink florets, have traditionally been used to symbolize true love and beauty. When giving one to that one and only you can send the message of eternal love and happiness. Where to Buy Roses you may still be wondering? Well there is only one place that offers all year round services, freshness upon delivery, and incredible shipping, the answer is Globalrose.com. All of Globalrose.com.s greenhouses are located in spots that provide sunny and perfect weather all year round. We use a special packaging process to insure freshness of your orders from our facilities to your door. We exclusively ship with the world renowned FedEx to provide speedy and hasty delivery. When your orders arrive at your door, do pay mind that they will take no more than three evening to full bloom into their magnificent full star shape. Where To Buy Rose Sweet Pink Roses, you may hear some ask, but know you know! Globalrose.com is the smart and sensible answer for all year round availability and quality.